Tom Zilke’s passion and excitement for the second year of his vegetable growing enterprise is palpable and communicated. “My thing is, I like putting a seed in the ground and I like growing it. If I can do that, I am happy. I’m very content. Extremely happy doing what I am doing.â€ His face crinkles into a smile and he does truly seem to be a man at peace with his life. Not only at peace, but thrumming with pleasure for his new projects and ideas. After all, I am talking to a man who turned his swimming pool into a greenhouse. 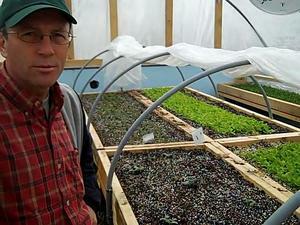 Three years ago, Zilke started growing serious amounts of vegetables on his 5 acres. Last year, Zilke Vegetable Farm signed up their first CSAs and started selling their naturally grown bounty at the Taylor and Ypsilanti Farmer Markets. This year they plan on selling at Milan, Dundee, and our very own Ann Arbor Westside Market as well. As with all things in nature, every year is an experiment. This year he experimented with covering onions over the winter. We were able to squelch out into the field, covered with recent snow melt, to see the onions that had over wintered in the “low tunnelâ€ hoop house. They were thriving under the cover. 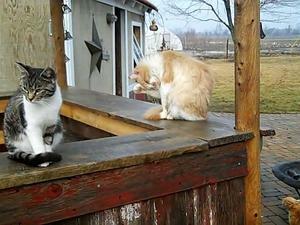 Visitors to the farm can enjoy visiting an old barn, cats that twine themselves around ankles, the pleasure of seeing the miracle of plant growth, but they can no longer swim. The pool is now the greenhouse. As Zilke explained, “this was the swimming pool and I took out the lining out of it and added insulation. I had the hoops out in the barn. And I dug a hole 42 inches down from the house to here, and I am running a line from the basement.â€ The line 42 inches in the ground is below the frost line and carries water, electricity, and airflow to the greenhouse. There is already much being grown because Zilke is hoping for fresh greens to be available in mid-May, “just to get a jump on it.â€ The Zilke’s will be getting a jump and families will be able to visit and see where their food comes from.